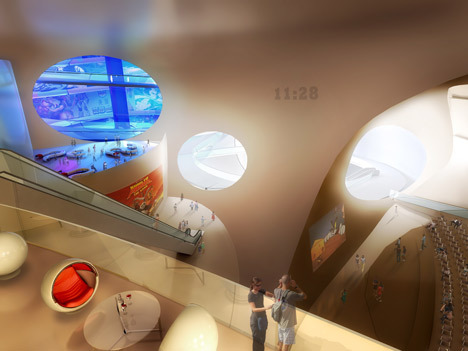 Comic and Animation Museum by MVRDV: "
The permanent exhibition space will spiral out of its chamber and on through the building to connect with three auditoriums and a comic book library. Where balloons touch an opening is created internally, allowing views between spaces. 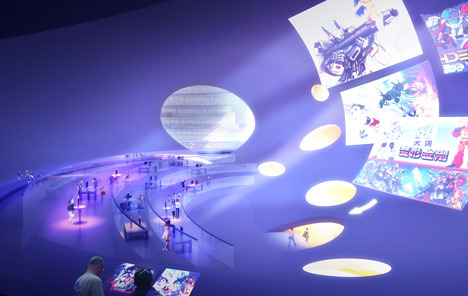 Hangzhou urban planning bureau has announced MVRDV winner of the international design competition for the China Comic and Animation Museum (CCAM) in Hangzhou, China. 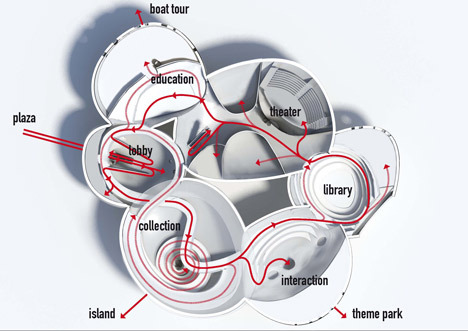 MVRDV won with a design referring to the speech balloon: a series of eight balloon shaped volumes create an internally complex museum experience of in total 30.000m2. Comics and animations have long been considered a form of entertainment for the younger generations but develop more and more into a sophisticated art form. The initiative for a museum especially for this relatively recent art form creates a platform which will unite the worlds of art and entertainment. 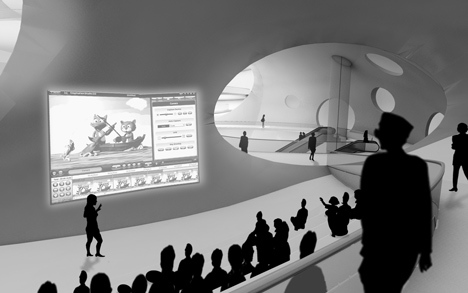 By using one of the cartoon’s prime characteristics – the speech balloon – the building will instantly be recognised as place for cartoons, comics and animations. The neutral speech balloon becomes 3d. 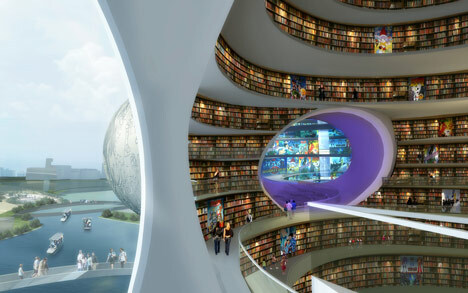 The 30.000m2 are distributed over eight volumes which are interconnected allowing for a circular tour of the entire program. Services such as the lobby, education, three theatres/cinemas with in total 1111 seats and a comic book library occupy each their own balloon. If two balloons touch in the interior a large opening allows access and views in-between the volumes. 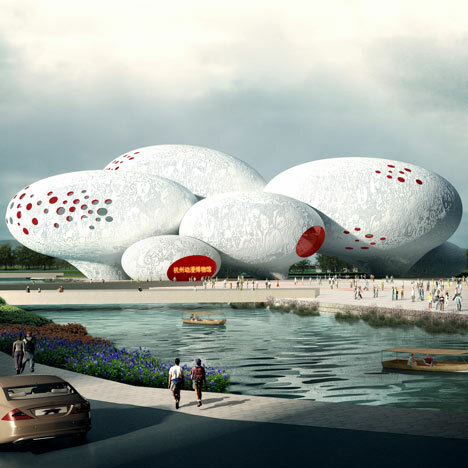 The balloon shape allows for versatile exhibitions, the permanent collection is presented in a chronological spiral whereas the temporary exhibition hall offers total flexibility. 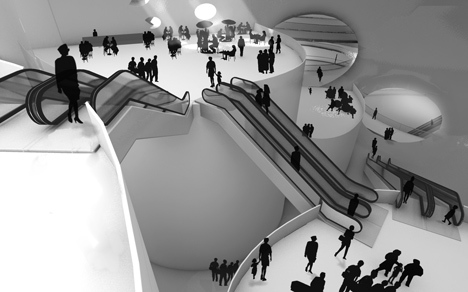 Amsterdam based exhibition architects Kossman deJong tested the spaces and designed exhibition configurations which appeal to different age groups and allow large crowds to visit the exhibition. One of the balloons is devoted to interactive experience in which visitors can actively experiment with all sorts of animation techniques like blue screen, stop motion, drawing, creating emotions etc. The core attraction of this space is a gigantic 3D zoetrope. The routing of the museum permits short or long visits, visits to the cinema, the temporary exhibition or the roof terrace restaurant. The façade of the museum is covered in a cartoon relief referring to a Chinese vase. The monochrome white concrete façade allows the speech balloons to function: texts can be projected onto the façade. 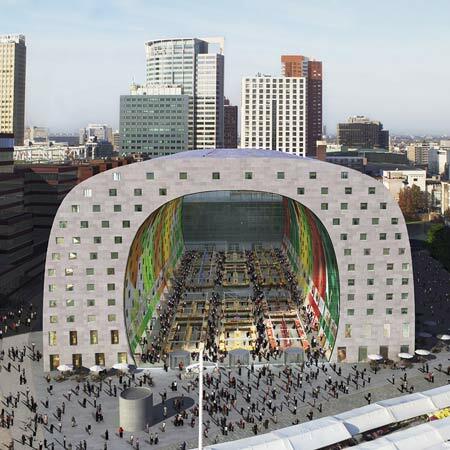 The relief was designed in collaboration with Amsterdam based graphic designers JongeMeesters. Most of the 13.7 ha site is occupied by a new park on a series of islands in White Horse Lake. Reed beds are used to improve the water quality. Boat rides offer an added attraction. 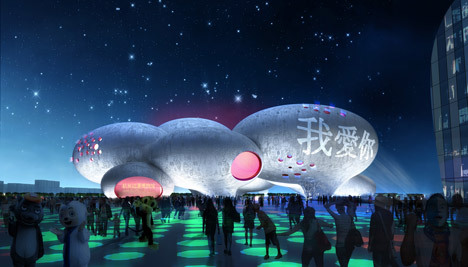 A separate expo building of 25.000m2 will house large fairs and the annual China International Comic and Animation Festival (CICAF). 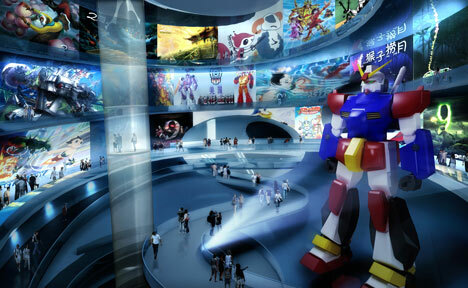 In-between expo and CCAM a public plaza will be the centre of this festival which is the county’s largest cartoon and animation event and has been held annually in Hangzhou since 2005. Hangzhou is a metropolis with 6.4 million inhabitants 180 km southwest of Shanghai. 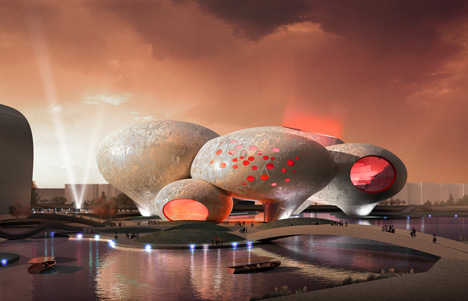 The Museum will become a new focal point on the less populated southern side of Qiantang river. 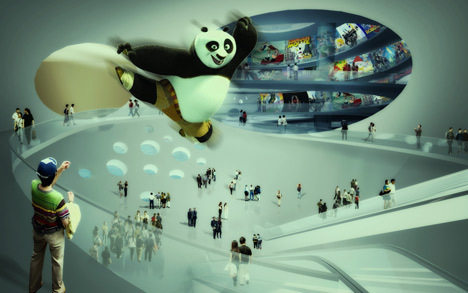 The CCAM will consolidate the city’s leading position as China’s capital of the animation industry. 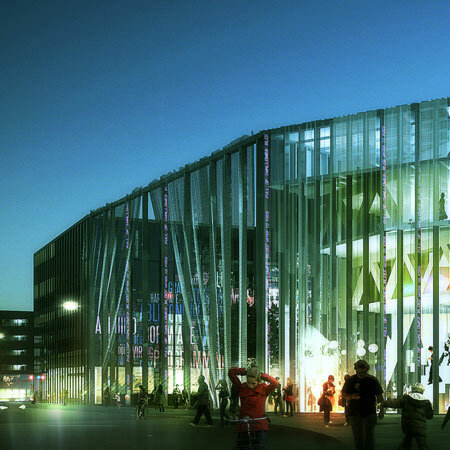 The new Museum will be the icon of a larger development, the Comic and Animation Centre. 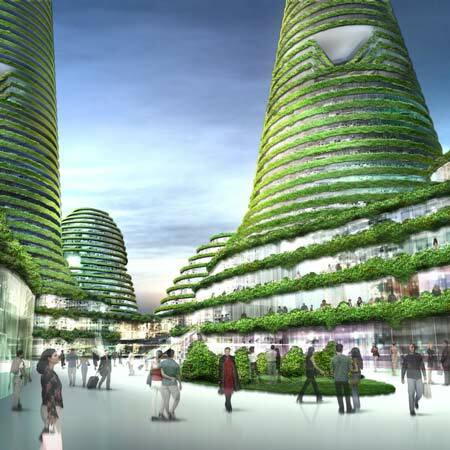 It comprises a series of hill-shaped buildings containing offices, a hotel and a conference centre of which the first phase is close to completion.